Not THIS year, folks. Put those plastic bags down and back away. It seems like Earth Day decided to stop celebrating birthdays after 40. Oh, but Earth Day, you don't look a day over 29, honestly. 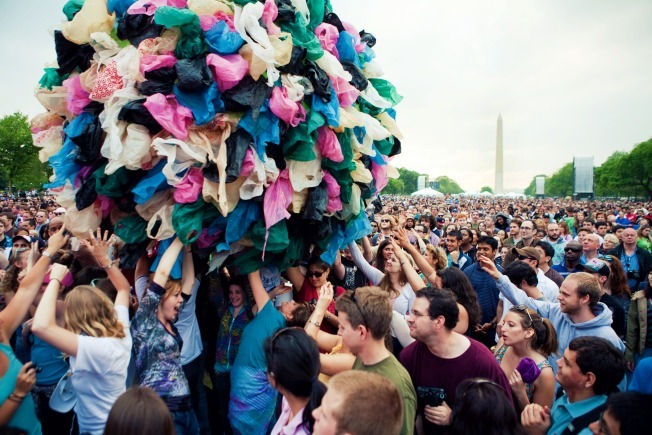 The National Mall has hosted Earth Day events on and off ever since the very first one in 1970 -- but 2011 is going to be an "off" year due to the confluence of Passover and Easter, reports the Washington Post. "So many of the congressional members that participate would be gone," Kathleen Rogers, president of Earth Day Network (the event sponsor) told the Washington Post. "We could have done it in May, but we thought it was best to focus on next year." Moving on! The theme 2012’s event will be “The Road to Rio,” a tie-in to the international Earth Summit scheduled to take place in Rio de Janiero next June. Past events have featured music from nationally known acts such as Sting, The Roots and D.C.'s Thievery Corporation.